Are you looking for a SUP board that can take to any kind of adventure? Well, try out the NRS Thrive SUP boards. The Thrive Series SUPs are best for any do-it-all paddler who likes light river paddling with lots of stability, touring, and fitness paddling. This SUPs also use the propriety Axis Technology which tremendously improves performance and stiffness. In short, this are arguably the best SUPs for any paddler. The NRS Thrive 10’8” Inflatable SUP, is arguably one of the best all-round paddleboards out there. It brings together different elements of paddleboard styles which will only leave you with a great experience. In fact, it’s very good for long distance touring as well as flat water and straightaways. 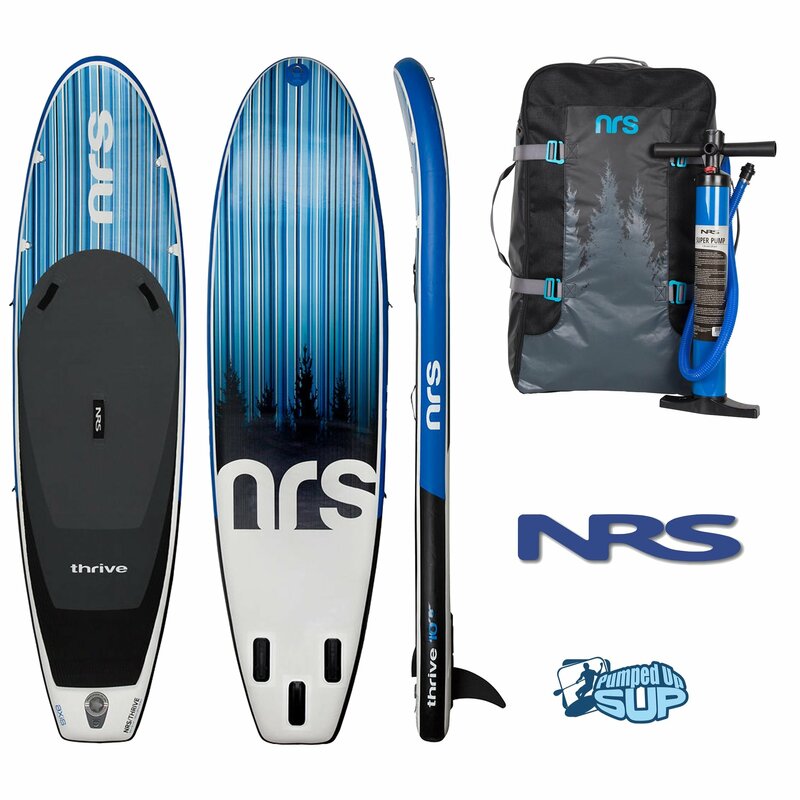 To make it even better, this NRS Thrive inflatable stand up paddle board comes with an attractive design and construction that you’ll definitely like. Just like the many other top-of-the-range SUPs, it uses the PVC drop-stitch which ensures superior durability – only comparable to those of many other hard boards. Still on durability, the double sidewall construction helps the board endure any kind of abrasion and contact. On the thickness side, this board is superior compared to most of its peers. At 6 inches and an extraordinary weight capacity of 250 pounds, it’s very stable when out paddling. Also, you’ll get maximum performance because of the ideal 20 PSI grants – this is simply as good as many other quality hard boards. About versatility, this NRS Thrive board has a whole host of features. The board comes along with a three-fin setup which is removable. This setup up has a 9-inch center fin, as well as 2 x 2-inch and 2 x 5-inch side fins. This enables riders to tackle several water conditions due to this superior level of customization. Still on the accessory packs, it includes a carrying backpack, bumper straps, repair kit, hand pump, foot leash, a HydroLock dry bag, and a carry sling. Now it doesn’t get any better than this, does it? • Inflates up to 20 PSI which guarantees improved performance similar to those of other hard boards. When deflated, it folds up compactly ensuring easy transportation and storage. • Double wall construction for durability –the PVC drop-stitch construction enables the board to stand up to abuse and abrasion. • 6 stainless D rings for attaching the leash and the gear. • Plenty of accessories like SUP backpack, repair kit, shoulder carry sling, high-pressure pump with gauge, 12-ft coil leash, HD buckle bumper straps, and HydroLock dry bag. In terms of performance, this 6-inch thick NRS iSUP is one extra-stable board that can hold more weight than you can imagine. If you like ocean paddling, the extra stability this 6” thick board offers is certainly a plus. Also, the decent amount of D-rings covering all the bases, the multiple fin attachments, and the extra handles at the front are good enough to hold onto while paddling/swimming. All in all, this board is good enough to be used on flat water lakes, ocean waves, and moving rivers. Just as board design, the fin technology is quickly progressing. That said, this NRS paddleboard has 5 removable polycarbonate fins which are also inexpensive to replace. The 2 x2-inch side fins are perfect for paddling around shallow rivers and surfing alike. Having a 2-inch fin instead of 4-inch on can also loosen the backend a bit giving you quicker curves. In combination with the 9-inch center fin, the 2 x 5-inch side bites are great for deeper rivers as well as flat water paddling. This board comes readily packaged with everything you might need to begin paddling straight away. It comes included with a well-built storage bag as well as comfortable backpack straps. It also comes with a 3-piece breakdown repair kit along with a nice storage pocket. It goes without saying that this board also has a K pump capable of inflating 20 PSI into the board. What’s the point of buying a SUP board that can’t effectively handle multiple scenarios? Well, on this front, this board succeeded because it’s tailor-made to handle a variety of scenarios. Although it’s not particularly the best on this category, it definitely holds its own. If you compare the warranty package of this board to most of its competitors, you’ll realize the 3-year retail/commercial warranty is one of the best out there. NRS has arguably the best warranty offer than most brands. This only proves the manufacture’s commitment to offer quality products, at a reasonable price. Not to mention their customer service crew who are very cooperative. The 250-pound weight capacity is one of the best out there. If you’re a heavier rider, this is certainly a board to break the bank for. At $1,014.93, this is certainly not the cheapest inflatable SUP in the market. However, if you add up all the included accessories plus the 3-year warranty, it’s actually a good deal. If you’re mainly hyper-focused on a particular riding style, this might not be the board for you. Also, its limited color options can be a turn off. All said and done, this is a very good board as it’s easy to paddle as well as being very versatile. In terms of durability, NRS Thrive boards are second to none. The coolest feature about this board is the 6-inch thickness which is good for rigidity and stability. It’s also ideal for larger people or those who like paddling around with their dogs.